In a perfect world, we’d all eat for free. But the next best thing to free food is food for less than what you’d probably find digging in the pockets of your old jeans. The Bronx might have a rich history as the last home of Edgar Allan Poe, the birthplace of hip-hop, and the home of NYC’s better Little Italy, but the borough is also a cheap-eats haven. Regardless what part you find yourself in, these are the best places to eat for under $5 in the borough -- from easy to-go snacks to full-fledged meals. On East 222nd in Baychester, you’ll find a totally unassuming, authentic Jamaican spot doing Caribbean favorites like ackee & saltfish and ripe plantains. Though dumplings are in the restaurant name, you’ll find the the crispy, fried numbers (which come without fillings and are really more like fried dough balls) under “sides” on the menu. Still, at just $0.50 a pop, they’re more than enough reason to make a visit. An order of two dumplings with a huge chunk of fried saltfish for $2.50 is one of the most popular budget-friendly buys, not to mention a seriously filling meal. Be sure to opt for the raw pickled-peppered onions on top to cut through the saltiness and add an extra kick. Landin is the Bronx’s answer to the East Village/Murray Hill favorite S’MAC -- except way cheaper. 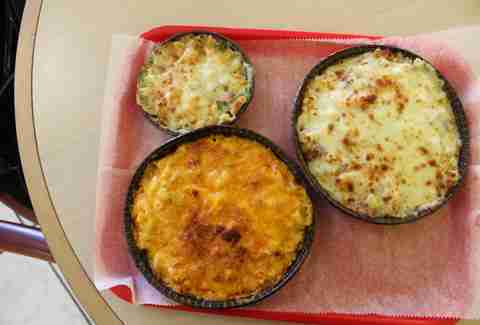 The savory baked mac & cheese dishes here come in mini sizes, so you can sample a recipe or two (or three or four or five) for just $2.25-$2.75, before you decide to opt for the bigger version, which is still crazy-affordable at around $6.00. The hot chicken with buffalo sauce, Mexican (with pepper jack, Muenster, chicken, pepper, and jalapeño) and bacon (mozzarella, Muenster, and bacon) are the running favorites for Melrose residents. Mexicocina is a charming and authentic Mexican spot with two locations in Mott Haven -- the first opened on Jackson Ave in 2008, and the second was added three years ago on 149th. Aside from space, the only other difference is the “c” vs “z” in the spelling of their names, which means you can score the super-cheap and filling Taco Mexicocina -- featuring a thick, handmade corn tortilla; chile chipotle; cheese; cilantro; and red onion -- for just $4 at either site. Plus, for just a dollar more, you can add in a generous helping of shrimp or fish. 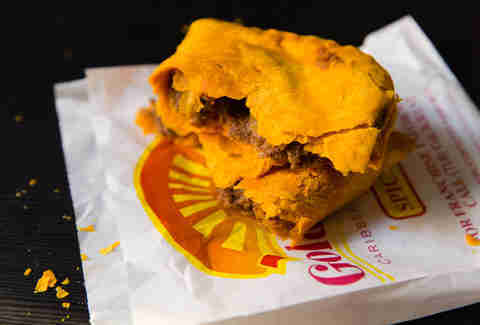 This Caribbean food franchise is the go-to for a Jamaican beef patty Uptown. Even though it's upped the price over the years, a single patty is still just $2.50. Most locations carry both chicken and beef options, but the spicy beef seasoned with garlic, scallion, and Scotch bonnet pepper is always a solid choice. Get yours early in the day when the filling is guaranteed to be piping-hot. There are a couple solid cheap eats you can score from this no-frills takeout Trinidadian food chainlet, like the dahl pouri roti, pholourie with tamarind dipping sauce, or current roll. But if you’re not walking out without roti, then you better have ordered doubles. Doubles are a popular Trinidadian street food consisting of cooked chickpeas lightly seasoned with curry and sandwiched between two roti flatbreads, which are fried to puffy perfection. Just one of Ali’s doubles can make for a filling meal, but with prices as low as $1.65, there’s no reason not to stock up. Once you get over the slight hurdle of communicating with the almost strictly Vietnamese-speaking waitstaff at this authentic Fordham Manor shop, you’ll never look at other summer rolls the same. Three rolls of thin rice paper come bulging with noodles, shrimp, and lettuce, making for one of the healthiest meals you can grab for under $5 in the Bronx. The name of this Kingsbridge restaurant directly translates to “milk and honey,” which is fitting for a place with a menu full of simple yet satisfying food, like a plentiful chicken & waffles platter for $10.99 that comes drizzled with syrup, or BBQ pulled pork with a helping portion of mac & cheese for just $13. The best deal on the menu, though? 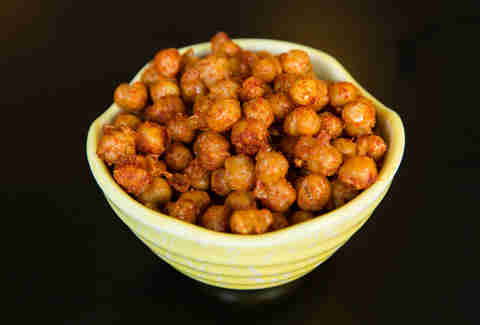 The fried chickpeas seasoned with paprika, a crispy and spicy dish that’s an homage to the owners’ Dominican roots, and which will only cost you $4.10. Since the Bronx has a huge Latino population, there are plenty of great places to get your hands on empanadas -- but the restaurant that Colombians in particular call home is the ultra-authentic La Masa, which offers traditional dishes like bandeja paisa -- a combination platter with everything from pork to chicharron to black pudding -- and over two dozen types of empanada, including both salty and sweet options, like chicharron or dulce de leche. Be sure to come back often, as it's always adding new varieties. 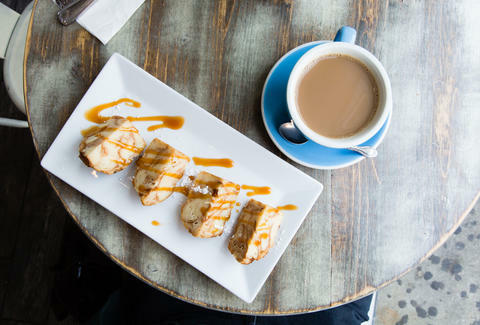 You’ll find the obligatory croissant and macaron offerings at the French-themed cafe, but the hidden cheap-eats gem is its version of the classic bread pudding, the $3.50 brioche diplomate, which is guaranteed to be more filling than the aforementioned options. Delivered fresh daily, the bread pudding is actually made with croissants, and often comes with a little added surprise, be it chocolate or raisins. It’s usually served toasted, and they'll happily top it with powdered sugar or caramel upon request. You won’t find esquites -- the bowl version of on-the-cob elotes -- at every Mexican restaurant Uptown, so the creamy, street-style boiled corn, made with a mix of mayo, cheese, and chili pepper, is a great reason to visit the original Estrellita Poblana, which has four sister locations throughout the borough. It’s an affordable and authentic snack (served in a 16oz cup) for less than $5. Roast pork rules the crowd at this popular Latin American food truck, which you can usually find parked up in the South Bronx. Fortunately, if you’re eating on a budget, it also churns out fresh batches of pastelillos -- the fraternal twin of the empanada -- that come with your choice of chicken, beef, crab, or shrimp for just $1.50-2.50. Tameika Lawrence is a Bronxite, foodie, and the creator behind the Bronx Food Blog. When she’s not eating locally, she's just eating in general. Follow her on Twitter.